Tradeshow Promotional Items - Avoid These 7 Costly Blunders! Enormous sums of money are wasted on tradeshow promotional items each year – and most exhibitors only get a fraction of their return on investment. Why? Because they spend their money on giveaways and not "repetitive message senders." If your prospect has a re-usable product, your company gets seen over and over again. The result? Your cost per impression goes down and your return on investment goes up. Retention is the key to maximizing effectiveness. It would be a simple world for exhibitors if every person walking the show floor was a buyer. The unfortunate reality is that this is not the case. Do not waste valuable time talking with unqualified leads who are talking to you solely to add to their overflowing bag of free promotional gifts. When most exhibitors think of trade show giveaways, they think of using them for one reason – to drive booth traffic. Most are overlooking one of the most powerful uses of tradeshow promotional items – to build customer loyalty through customer gifts. The number-one reason suppliers lose customers isn’t because of price or service. Rather, customers leave because they feel their business is no longer appreciated. Managing against tight budgets – and even budget cuts – is something almost everyone endures from time to time. Yet, when you have less money to spend, don’t compromise your image with a cheaper version of a more expensive item. For example, if you have $1.00 to spend on each of your tradeshow giveaways, you should be buying the highest quality item you can buy for a dollar. Do not buy a cheaper version of a better quality item. So what portion of your overall responsibility includes purchasing tradeshow promotional items? 1% or less? This is probably the reason why so many buyers find themselves ordering late and paying for rush service and overnight shipping. Advance planning is essential when ordering products. You should place your order three weeks in advance to accommodate art preparation (1 to 2 days), production (standard 5 to 10 days) and shipping (ground 1 to 5 days). Blunder #6: The Show is Over… Or is it? You know feeling at the final hour, right? Phewfff… it’s over. If you are like most exhibitors, you pack up your booth and wait until the next show to market again. Yet, the companies that get the best results market continuously to their show contacts throughout the year until the next show. If you’re planning to use tradeshow promotional items at your event, you need to carry different levels of customer gifts to give to different customers. Think about it this way – say you get 80% of your business from 20% of your customers. Those 20% deserve most of your attention and appreciation. You need to give them something fitting of their contribution to your success. This article was written by R.J. Williams of PoorRichardsPromos.com, a company that specializes in trade show giveaways and customer gifts. Quotes from Independent Suppliers – No Obligation to Buy! 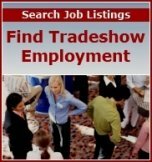 Receive free price quotes from independent suppliers of tradeshow promotional products, courtesy of BuyerZone.com. Begin by answering the question below and clicking on the "next" button.